Content marketing is marketing technique of sharing content in order to engage current and potential consumer bases and create brand awareness and engagement. According to the Outbrain State of Content Marketing 2012 report, content marketing continues to be one of the most used techniques of the online marketing world. 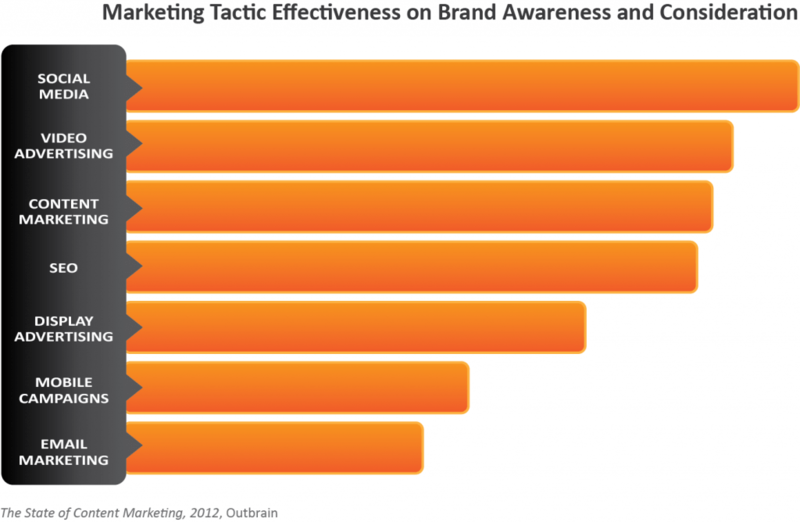 100% of brand and agency marketers surveyed utilize content marketing in their overall marketing strategies. Video is the most common form of content created. Social media is the most popular channel marketers use for driving traffic to content. Marketers employ content marketing efforts to drive brand awareness and target top of purchase funnel consumers rather than for generating direct leads or sales. Social media engagement is the most popular indicator marketers consider when measuring the success of content marketing, followed by views or content downloads. The marketers surveyed all utilize content marketing as a part of their overall marketing strategy and are currently creating digital content specifically for informational and/or entertainment value to consumers. Social media is an important tactic for content marketing. 96% of marketers utilize social media platforms such as Twitter, Facebook and YouTube to distribute their brand’s digital content. Social media engagement ranked as the most popular factor that marketers use to measure the success of their content marketing efforts. The survey results found increased emphasis on success metrics that focus on brand awareness and target consumers in the top of the purchase funnel.